As stretches of one’s career go, Trevor Moore’s past seven months haven’t been too shabby. 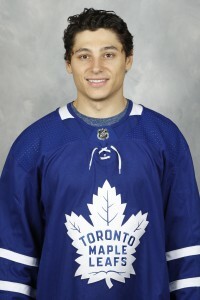 • In June, he helped the Toronto Marlies win the American Hockey League’s (AHL) Calder Cup. Moore was a key cog in the playoff run, ringing up 17 points in 20 postseason games after 33 points in 68 regular-season games. • On Dec. 23, he was called up by the Toronto Maple Leafs on an emergency basis and made his NHL debut, a 5-4 overtime win over the Detroit Red Wings. • On Jan. 5, Moore scored his first NHL goal – on Hockey Night in Canada no less – blowing past a Vancouver defender on a rush and firing a wrist shot through Jacob Markstrom’s five-hole. • In between, he was selected to his first AHL All-Star Classic after a start that saw him score nearly a point per game (26, including a team-high 19 goals, in 30 games). Along the way, the Thousand Oaks native became the fourth member of his 1995 LA Selects team to play in an NHL game, joining Eric Comrie and Chase DeLeo, who both did it for the Winnipeg Jets, and Adam Erne, who did it with the Tampa Bay Lightning. And he could have more company in that club as Andrew Oglevie and Scott Savage are playing in the AHL, and Matt O’Donnell and Ryan Siroky are NCAA standouts. Moore received the call from the Leafs on Dec. 22, and it gave him time to try to get family members and friends to Toronto for the next night’s game. Several, including his father Dave, were able to make it. While the speed of the NHL was a bit of an adjustment, Moore was heartened by his experience. 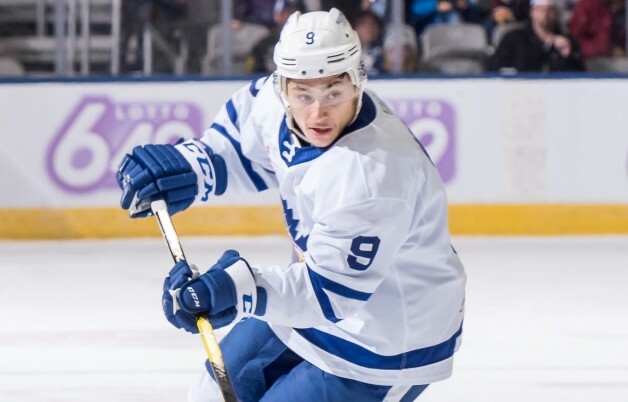 Having gone through multiple prospect camps – he was signed as an undrafted free agent in 2016 after three seasons at the University of Denver, where he was a Second-Team All-American in 2015 – and playing two and a half seasons with the Marlies also helped his transition. Moore also was treated to a time-honored debut tradition by his teammates – the solo lap. Led to believe he would lead the team out to warmups, he hopped onto the ice only to realize he was skating by himself. Moore said he received quite a bit of feedback from Leafs coach Mike Babcock during his six-game stint and when the team told him he’d be returned to the AHL, at least for the time being. A return isn’t guaranteed, but for the better part of two weeks Moore was able to take on a new job description – NHL player. “It’s definitely not something I’ve been able to say before,” he said. But the Leafs must have liked what they saw. On Jan. 13, Moore signed a two-year contract extension. Why mess with a good thing?